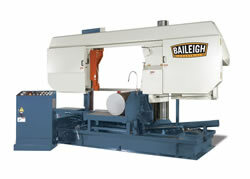 Baileigh Industrial has a full line of manual, semi-automatic and fully automatic band saws in dozens of varying sizes to fit most production requirements. Several of our most popular models are highlighted below.Call 920-684-4990 Today! The BS-210M is a fantastic mitering saw(0-60°) that has a 7” round capacity. This machine comes standard with a variable speed direct drive system, hydraulic and manual descent, taper locking vise and table, and so much more. This small but heavily loaded powerhouse band saw runs on 110 volts and is very reasonably priced for any demanding small shop. The BS-350M is a direct drive dual mitering saw (0-60° R, and 0-45° L) that allows for miter cutting complex channel and much more. This band saw has a 10-1/2” round capacity and comes standard with a powerful variable speed drive and large 1” wide blade for precise cuts every time. A heavy ductile cast iron head and table provides solid rigidity and can be operated in the manual or hydraulic descent mode. 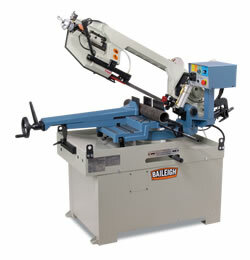 This is a great production saw for any fabrication shop setting. The BS-20SA-DM is a semi-automatic dual mitering band saw (0-60° R, and 0-45° L) that boosts a massive 1-1/4” wide blade that is driven via a variable speed inverter direct drive system. 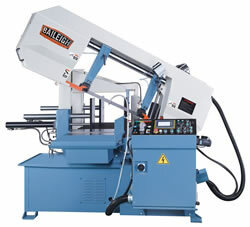 A rigid band saw head lifts and descends using a hydraulic feed system for perfect cuts every time easily allowing for serious production at the machines full capacity of 13” round or 13” X 18” rectangle. The BS-24A is a fully automatic mitering saw (0-45°) that has a huge 1-1/2” wide blade ensuring some of the straightest cuts in the industry. This automatic band saw has easy to use touch screen controls that allows for storing hundreds of programs and actuates the precise bar feeder, vise, down feed, blade and cycle speeds. This is a production workhorse mitering band saw that can be operated in the automatic or semi-automatic mode offering true versatility. The BS-24A has a large 18” round capacity and allows for rectangles up to 24” wide. 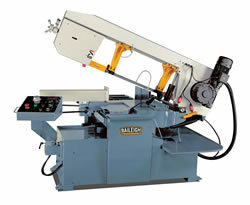 A perfect saw for any demanding machine or fabrication shop, requiring large production runs. The BS-800SA is a very robust dual column band saw that has a huge 31-1/2” round capacity that is perfect for any steel production house. This massive semi-automatic saw is fully loaded with features such as variable speed, motorized blade cleaning, auger driven chip removal, and much more. The rigid dual column system coupled with a large 2” wide blade and smooth down feed and up feed hydraulic system allows for extremely tight cut tolerances even when cutting at maximum capacity. 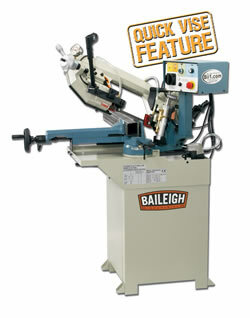 (920) 684-4990, or send an e-mail tosales@baileighindustrial.com.